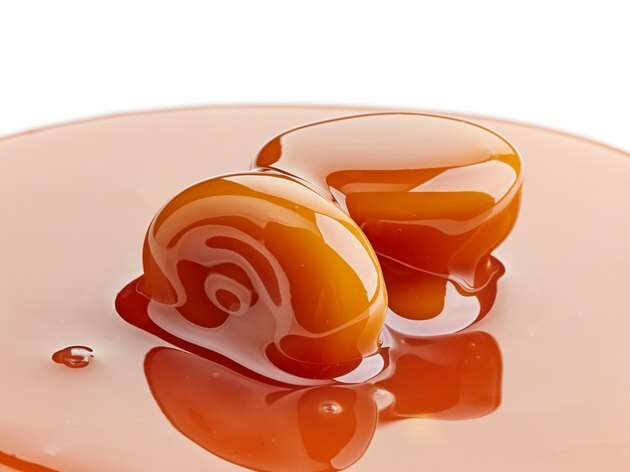 Werther’s Original produces numerous varieties of caramels, including chewy caramels, caramel-filled candies, caramel chocolates and even sugar-free flavors. But Werther’s Original is most famous for its classic hard candy in the distinctive gold wrapper. According to the official Werther’s Original website, a serving of three candy pieces contains 70 calories, meaning a single piece has 23.3 calories. The official Werther’s Original website notes that three pieces of its classic hard candy provide 1.5 g of fat, 1 g saturated fat, less than 5 mg cholesterol, 45 mg sodium, 14 g carbohydrates, 10 g sugar and 0 g protein. Werther’s Originals makes its hard candies from sugar, glucose syrup, cream, butter, whey, salt, emulsifier soy lecithin and vanillin. In 1903, August Stock founded the Werther steam-powered candy factory in the small German village of Werther. One of the company’s employees, Gustav Nebel, devised the recipe for Werther’s Originals and created their trademark flavor. How Many Calories Are in Salt Water Taffy?